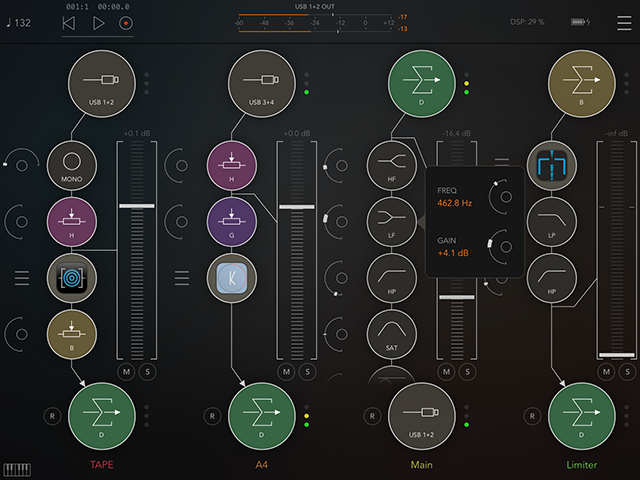 In this iOS music app review, San Francisco’s Scott Whitehead introduces us to AUM, a flexible audio mixer, recorder, and connection hub for iPad, iPhone, and iPod developed by Kymatica. 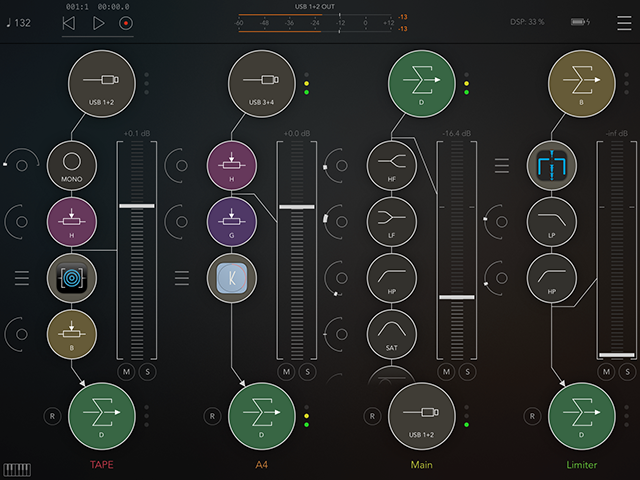 By the time you read this, AUM will already be well on its way to changing how music is made on an iPad. In our last review on AUM here, we looked at a pre-release version and discussed AUM’s implementation of features found on mixing desks such as track levels and send busses. Not content to be just good enough, the released version of AUM added native effects, versatile audio file recording, and audio playback as well as other features. On each track, you can add various audio effects that are built into AUM. There is full MIDI control available for live manipulation from a hardware controller or another program, and assigning MIDI CC values is easy. The extensive and powerful selection of filters, stereo, and dynamics processing are the sort of thing you would find on a high-end mixing console, and more important, they sound good. You can also add as many effects as your iPad CPU can support. The high and low pass filters with adjustable resonance add a lot, or a little flavor with the beautiful sizzle you might hear on an analog synth or DJ mixer. Additionally, AUM offers high and low pass shelf filters with adjustable gain and frequency. The different filter options are great for evening out a mix. There is also an EQ for fine tuning. 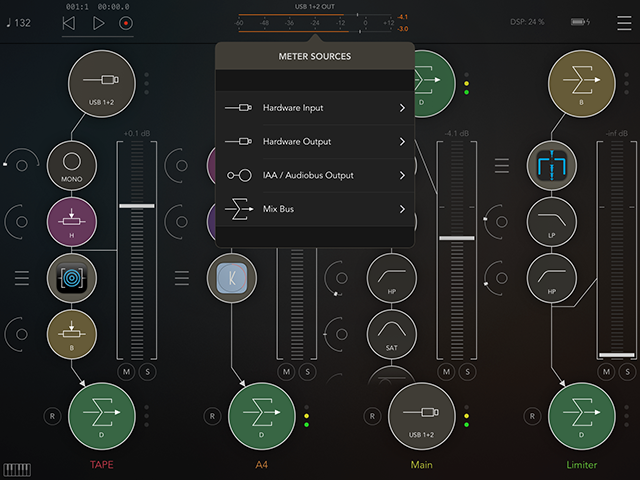 Each of these effects shows a basic setting on the AUM display, and additional values are available by tapping on the filter’s icon. Borrowing further from high-end mixing desks, AUM provides a range of built-in modules for dynamic control. These four takes on a compressor can be used to rein in a mix, protect downstream gear or add compressor distortion in the form of gain and clipping. Again, the main setting is brought to the front of the interface, and additional tweaks are available under a finger press on the compressor’s icon. Finally, the versatile stereo utility plugins can manage stereo image and phase. This sort of attention to the needs of a professional studio are essential to give sounds their own space in the mix. 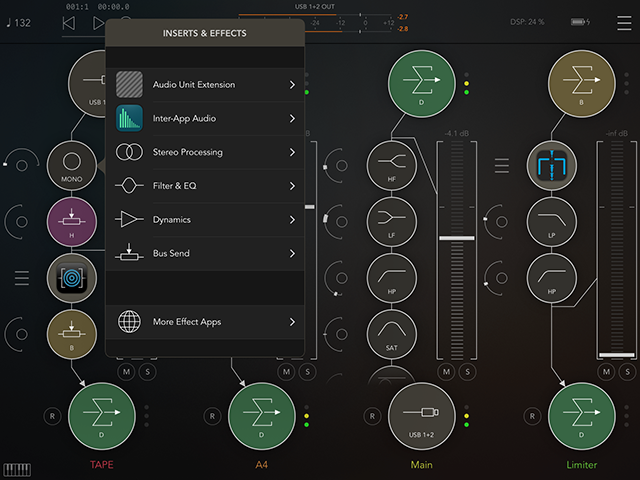 For effects beyond what is built in, AUM ships with excellent integration to other audio apps via AU and IAA. Naturally, there’s support for Kymatica’s other effects apps, which round out the reverb and delay nicely. But any IAA or AU is handled with the same care. AUM will send MIDI to your apps including clock, and if AUM has trouble loading an IAA app, it will coach you through getting it to work. AUM offers flexible audio recording as well. You can record each track to individual audio files or record the entire mix. If you get in the habit of hitting record at the beginning of a jam session, you can go back and slice out the magic moments, or bounce the whole mix and review your practice. Elegant integration with Kymatica’s own AudioShare means that the files are easily exported to other applications, and can be trimmed, normalized, or converted. 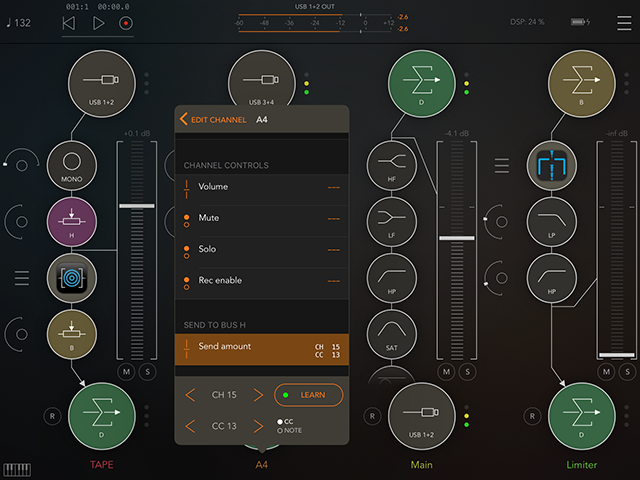 Once you have built a library of recorded audio, AUM will let you play your backing tracks on their own dedicated mixer channel that is tempo synced. In addition, a full range of effects and controls are available to process your sounds further. Already, it’s easy to see how AUM can take over your iPad recording studio. That’s not all; there’s more! AUM offers several types of meters to provide visual feedback. There is a simple three color LED-type meter at the input and output of each track. These meters are useful for basic troubleshooting or seeing at a glance whether you’re in the red. At the top of the screen is a Bus Meter. This meter is larger and is always at the center of the screen. By default, it is set to show the level going to your primary hardware output. However, with a tap, you can assign this to any of AUM’s channels or busses and get a more detailed view of audio levels. There are design enhancements planned to make this even more easy to read. Working with AUM is extremely easy, and the design is beautiful to look at as well. In addition, the app is capable of handling a large workload and has proven to be very stable and CPU friendly. 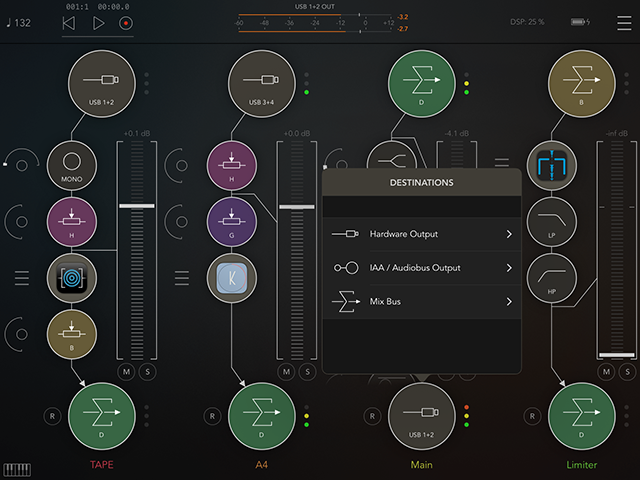 It is a great tool for managing complex audio routing and putting all of the important bits under a proverbial pane of glass that can be accessed with a single tap. 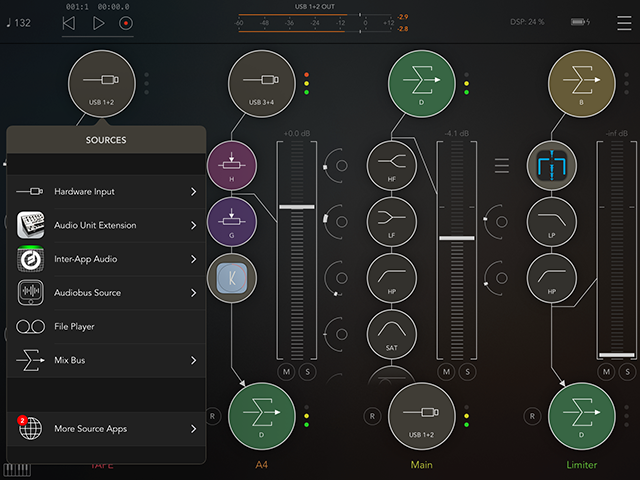 Also, the apps capabilities can be extended when paired with a high-quality audio interface that has multiple ins and outs to add a hardware controller making AUM a full-blown instrument, and overall a very powerful music-making studio at your hands. We hear there is an update in the works. Given the track record Kymatica has of predicting what the studio of the future is missing, I have to assume the next release will make ice cream. We can only hope. Aum is available to download at the App Store here.